As the New Year approaches, I thought as a personal trainer/yoga instructor it would be important to take some time to send a message to everyone looking to make health and fitness part of their New Year’s Resolution. So often at the beginning of a New Year, we look back on the past year and realize we fell short of our fitness goals. A large reason for this failure is that we didn’t take the steps to make our New Years resolution a life style change. The only way to actually succeed in losing weight and/or living a fit and healthy life is to create systems that are healthy.–The Secret to Fitness is to establish a routine! Your New Years resolution shouldn’t be to lose weight, it should be to establish a fitness routine with http://slimmeryoufitness.com. Humans naturally fall into routines. You wake up and take a shower. You have a Starbucks Frappuccino on your way to work. You go out to lunch with colleagues. You get a bag of chips in the afternoon to hold you over until dinner. You eat ice cream after dinner. You watch the Biggest Loser on Tuesday night. You workout first thing in the morning, then take your shower.–Rather than watching people work out later at night you workout yourself! You will be more awake and energized for your day + already have a calorie deficit to start the day! You have a protein shake mixed with coffee on the way to work–refueling your muscles and caffeinating your system at the same time. You pack your lunch with healthy food from home. You eat a chocolate peanut butter think thin bar instead of the bag of chips to hold you over until dinner. If the second set of habits doesn’t sound appealing to you, that’s because you’ve programmed your brain to do the first set. The first week of starting a new routine, we break bad habits. The 2nd and 3rd week we reprogram our brains to start to anticipate and crave the new habits. After about a month, these new healthy habits become our routine. 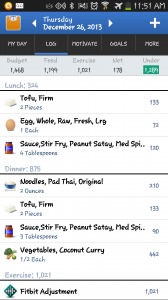 Because our cravings and wants often work against our best intentions to start new routines, using tools such as Loseit.com and Fitbit can help keep you to your new habits until they’ve become routine. You have to get 5,000 steps a day in addition to exercise or 10,000 steps on the days you don’t. These are easy rules to follow. They are black and white–there is no room to make excuses. The nice thing about rules is if you follow them you make room to sneak some of those bad habits back in every now and then. 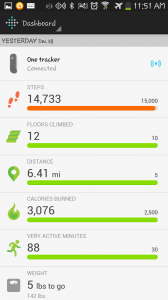 Fitbit is a tool that keeps you accountable for your movement. If you keep the rest of the day lean and get your exercise in, you may have more calories at the end of the day to have that small ice cream after dinner, or beer, or starbucks frappuccino–whatever your vice is. That’s why loseit and fitbit are good tools. They will tell you in black and white if you have the room to indulge. If you don’t–YOU DON’T INDULGE. It’s that simple. Who knows perhaps after doing so much to be healthy, you may not even want to break the progress you’ve made by indulging at the end of the day. When you think about it, being healthy isn’t hard it’s breaking the unhealthy habits that is. 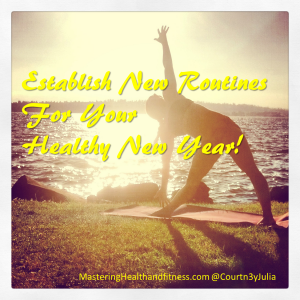 So make the commitment to your health this New Year to establish new routines. What day to day habits are keeping you from reaching your goals? 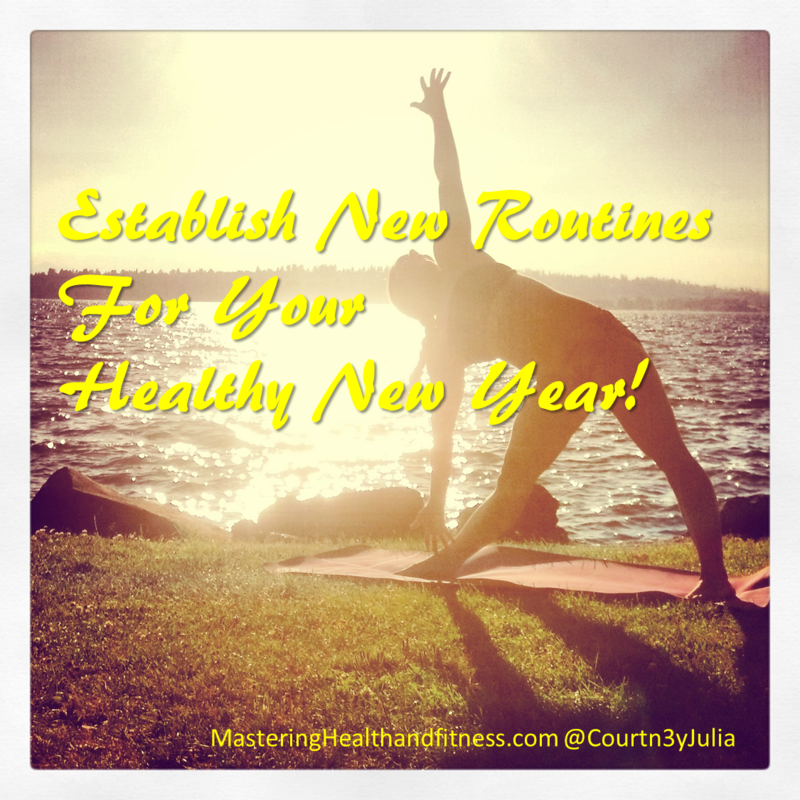 What are you going to do this year to turn an unhealthy habit into a healthy routine?